The Universal Translator Blog is a sub-project of the LCARS 47 Development Project, a unique freeware canon accurate LCARS application suite. Some of the rectangular letters have one, two or three rectangles cut out of the top of them. One or two dots occur in texts frequently between the main rectangular letters. 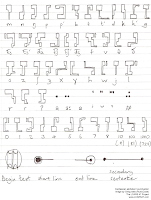 All of this indicated that something a little more intricate than a simple alphabet was going on. 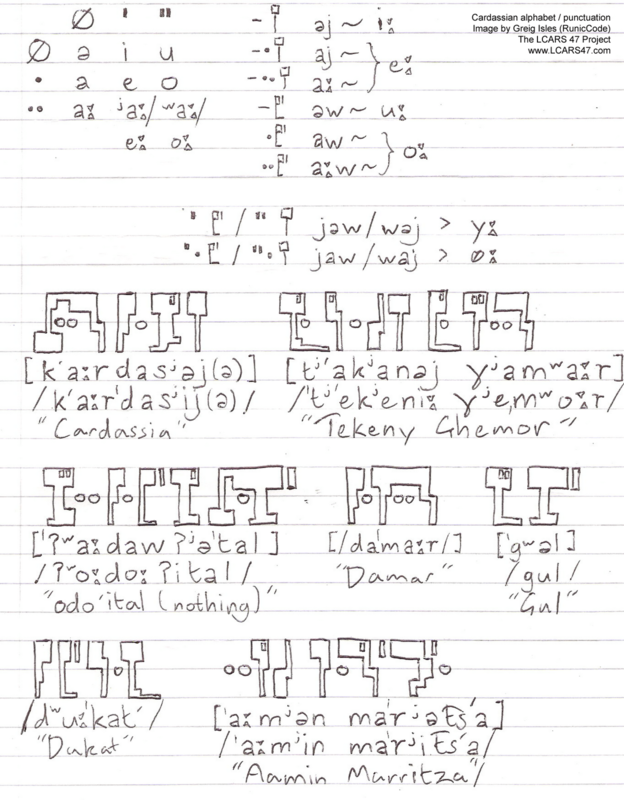 I decided to look to Star Trek for examples of Cardassian words, names, and phrases to give me a clue about what kind of sounds a written language should be representing. There were very few actual Cardassian words to go on, but there was a large number of names of things, such as people, planets, ships, etc.. 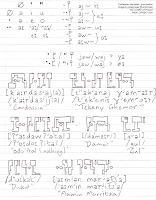 This gave me the clue that the phonology of Cardassian was as complex, of not more so than English. At this point I looked to inspiration in the other languages of the world, and noted with interest the Caucasian languages of South West Russia and the Caucasus Mountains. These languages (in particular the Northwest Caucasian languages) have very few vowels (usually just "ah" and "uh"), but very intricate consonant systems: the consonants have secondary articulations such as palatalization (pronouncing a consonant simultaneously with a "y" sound), labialization (rounding the lips simultaneously to give a "w" sound), and pharyngealization (a tightening in the throat). These secondary articulations affect the two basic vowel sounds to give the languages more actual vowel sounds than there appears to be at first glance. There are 37 basic consonants, many more than English. Cardassians has a three-way distinction between stops consonants and affricates: voiceless & voiced (like in English) and ejective (pronounced with a glottal stop; the sound in-between the "uh" and "oh" in "uh-oh"). There are only 3 base vowels: a schwa or "uh", which is unwritten; "a", written with one dot; and "ah", written with two dots. Most of the consonants can have secondary articulations: palatalization, indicated with one rectangle in the upper corner of a letter; labialization, indicated with two rectangles; and pharyngealization, indicated with three rectangles. The secondary consonant articulations effect the pronunciation of the base vowels: after palatals, "uh" becomes "i", "a" becomes "e" and "ah" becomes "ae"; after labials, "uh" becomes "u", "a" becomes "o" and "ah" becomes "oh". Pharyngealized consonants don't affect the pronunciation of the basic vowels too significantly, but they do give the syllable a slightly creaky sound. The semi vowel consonants, "y" and "w" affect the vowels the same way the secondary articulations do. At the end of a syllable, "y" and "w" lengthen and alter the preceding vowel. In part two, I will discuss writing direction, paragraphs & punctuation, and anything else I've left out of here, because this is beginning to turn into a novel! Originally posted by Greig Isles on 31 August 2012. Hi, I'm Greig, I like Star Trek, languages, writing systems and I am the project 'exolinguist' for LCARS 47. I am from South Yorkshire, England, and have been an avid Star Trek and sci-fi fan from a young age. 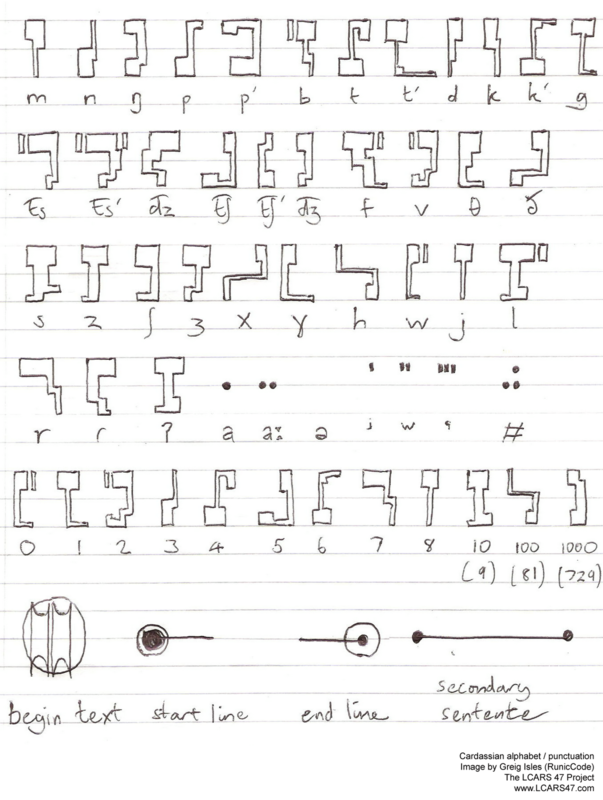 This blog is dedicated to creating and designing alien writing systems as seen and used in Star Trek. I would like to thank Mike Okuda, Denise Okuda, Rick Sternbach, Wendy Drapanas, Doug Drexler and the rest of the Star Trek scenic art design team, without whom, this blog would not be possible! Star Trek and related marks are registered trademarks of CBS® / PARAMOUNT® PLC. The LCARS 47 applications are made in good faith that they do not infringe on the intellectual property of CBS® / PARAMOUNT® PLC. This work is solely intended to promote the Star Trek franchise and for the enjoyment of fans. This package is freeware. Adobe, Macromedia, Flash and Photoshop are registered trademarks of Adobe® Systems Incorporated. All other marks are property of their respective owners. Original LCARS design credit: Mike Okuda.